Events not included in the basic Congress fee are labeled OPTIONAL. 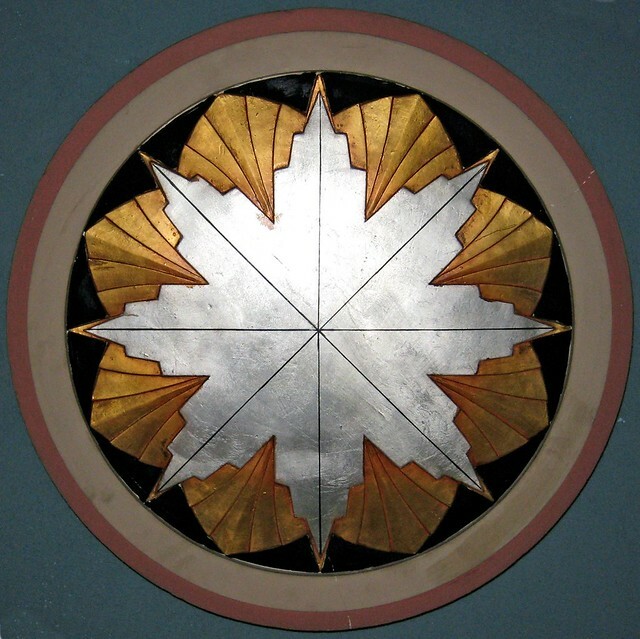 6:30 to 9:30 PM RECEPTION IN THE HALL D’HONNEUR AT MONTREAL CITY HALL, viewing of the five Art Deco stained glass windows in Council Chamber designed in 1926 by John Patrick O’Shea representing Religion, Agriculture, Shipping, Commerce and Industry. Music was provided by vocalist Patti Payne and the Boys From Murray’s – a hot combo including banjo and violin. Patti sang songs associated with Montréal in the 1920s and a selection of popular songs including those of Irving Berlin and Cole Porter. The event was catered by Dansereau, one of the five best caterers in North America. All Day The Montreal Jazz Scene, Vitrines of the fofa Faculty of Fine Arts Gallery, Concordia University, 1515 Ste. Catherine Street West, May 25-30, 2009. The Concordia Archives, Nancy Marrelli curator, presents a display of graphic materials from the 1930s-1950s from its remarkable holdings of documentation related to Montreal night clubs and the Montreal jazz scene. 8:00 to Noon BUS AND WALKING TOUR OF ART DECO SITES IN ROSEMONT, buses leave Loews Hotel Vogue. Sites visited included Dominion Oilcloth and Linoleum, Eglise St-Esprit, Eglise St-Jean-Berchmans, Botanical Gardens, Piscine Rosemont, Ecole Louis-Hébert. 2:00 to 4:00 PM BUS AND WALKING TOUR OF ART DECO SITES IN LITTLE ITALY. Sites visited included Casa d’Italia, CPR Park Avenue Station, Château Theatre, Police and Fire Station 31. 6:00 to 10:00 PM RECEPTION, LECTURE AND TOUR OF UNIVERSITY OF MONTREAL Buses left from Loews Hotel Vogue and took delegates to the Art Deco Main Pavilion of the University for an introductory presentation in the Art Deco amphitheatre, a guided tour, exhibit and buffet supper. The event will be catered by Dansereau, one of the five best caterers in North America. 8:00 AM to 12:30 PM LECTURES AND EXHIBITS AT MOYSE HALL , BAGELS AND BOOKS. Books will be sold in collaboration with the CCA BOOKSTORE. 2:00 to 4:00 PM BUSES TOUR TO ST. JOSEPH’S ORATORY AND COTE-DES-NEIGES DISTRICT. Buses leave from Faculty Club. 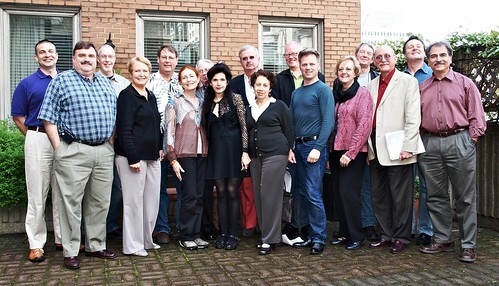 2:00 to 4:00 PM GUIDED WALKING TOUR OF DOWNTOWN ART DECO leaving from the Faculty Club. Sites to be visited include Peterson Hall, Central Station, Crescent Building and Holt Renfrew. 6:30 PM DINNER DANCE AT THE MOUNT STEPHEN CLUB, a wonderfully preserved Victorian mansion from Montreal’s heyday as the financial capital of Canada and very conveniently located in the same block as the Loews Hotel Vogue. We danced to the music of Brianne de Verteuil and Her Savvy 6, with vocalist Patti Payne, dedicated to performing the music of the John Kirby Sextet, 1930s Duke Ellington some Gershwin and even, to keep a Montréal connection, a couple of pieces composed by Carmen Lombardo – brother of Guy, leader of the renowned dance band, The Royal Canadians. 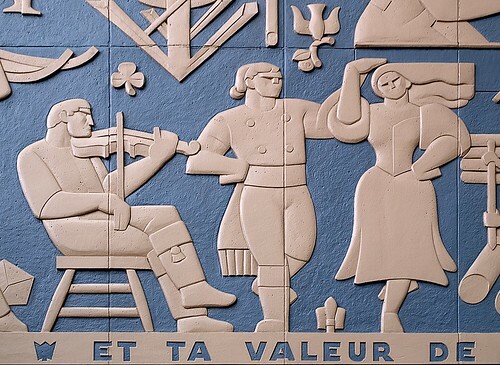 2:00 to 4:00 PM BUS AND WALKING TOUR OF ART DECO SITES IN OLD MONTREAL AND SAINT- HENRI. Buses left from Faculty Club. 4:00 PM to 6:00 PM BUSES WILL BRING DELEGATES TO L’AFFICHISTE, A GALLERY SELLING VINTAGE POSTERS, FOR A RECEPTION. THEY CAN THEN VISIT THE MANY ANTIQUE STORES ON NOTRE-DAME STREET. 8:30 PM L’INHUMAINE: Art deco film anticipating the1925 Paris exposition at the CINÉMATHÈQUE QUÉBÉCOISE 335, boul. De Maisonneuve Est near St. Denis — Berri-UQAM metro station (St-Denis exit)Tél. (514) 842-9763. Tickets $7 at the door. Selected by Oksana Dykyj, Head of Visual Media Resources in the Faculty of Fine Arts, Concordia University.The year 1923 marked an important date in the work of architect Robert Mallet-Stevens. It saw his first major architectural construction, the villa in Hyères for the vicomte and vicomtesse de Noailles, and the start of his most famous work as a set designer/architect on the film L’Inhumaine directed by Marcel L’Herbier. He gathered around him others to contribute to the art direction of the film, including, Fernand Leger, who designed the sets for the interior of the laboratory and Claude Autant-Lara who later became famous as a film director, did the landscape architecture and collaborated on interiors with Alberto Cavalcanti. Paul Poiret, for whom Mallet Stevens was to design a villa that was never completed due to Poiret’s eventual bankruptcy in 1926, was the costume designer. René Lalique, Jean Puiforcat, and Jean Luce were responsible for the decorative objects while Pierre Chareau and Michel Dufet created the furniture, and Raymond Templier, the jewelry. This mass collaborative effort came about almost as a dress rehearsal for the Paris exposition in 1925. 7:30 to 10:00 PM OPTIONAL DAY BUS TRIP TO OTTAWA, CAPITAL OF CANADA. Highlight visits will be the SUPREME COURT OF CANADA, the out-standing Art Deco banks, the former WELLINGTON STREET BRANCH OF THE BANK OF MONTREAL and BANK OF CANADA, the former METROPOLITAN LIFE BUILDING with its dazzling lobby mosaic ceiling, and the magnificent Art Deco FRENCH EMBASSY. We will be greeted at the NATIONAL GALLERY OF CANADA for lunch and a lecture on Canadian Art Deco by Charles Hill. Dinner will be at the famous FAIRMONT LE CHATEAU MONTEBELLO, the world’s largest log castle, built in the 1930s on the shore of the Ottawa River half way between Montreal and Ottawa. 6:30 PM OPTIONAL CLOSING DINNER DANCE GALA AT LION D’OR. Vintage or festive attire encouraged. The 1930 Lion d’Or is the only remaining example of a night Club of the days when Montreal was Sin City. All are welcome to this very special evening event, as long as tickets, space, last. We suggest early reservation. Dance to the music of L’Orchestre Moderne, directed by Andrew Homzy, Professor of Music at Concordia University. L’Orchestre Moderne, a 13-piece band with vocalist Patti Payne, replicates the hotel and ballroom orchestras of the past through its repertoire – plenty of swing, fox-trots, a few tangos, waltzes and sambas – and through its instrumentation which includes a trio of violinists. If you play a musical instrument, bring it along with you for a jam session with the musicians. Arrange your own transportation, taxi or public transport. 11:00 AM to 4:00 PM VIEWING OF ART DECO BOOKS AND ERNEST CORMIER DRAWINGS AT THE CANADIAN CENTRE FOR ARCHITECTURE. 7:30 AM to 10 PM OPTIONAL DAY BUS TRIP TO THE EASTERN TOWNSHIPS. Art Deco Churches in Granby, Cowansville, and Magog, examples of bellotism, a form of ecclesiastical Art Deco unique to Quebec outside of Europe, will be visited as well as the ABBEY ST-BENOIT-DU-LAC designed by Dom Bellot himself with additions by his disciples. Lunch will be as the excellent L’ACTUEL in Magog. Supper will be at Agur Restaurant-Galerie in Knowlton, a combination of a contemporary art gallery and a tapas bar. 7:30 AM OPTIONAL TRAVEL TO QUEBEC CITY for those attending the Post-Congress, preferably by Via Rail. We will walk from the train station to the Clarendon Hotel viewing Art Deco buildings on the way. Luggage will be transported to the hotel separately by taxi. Most of the sites included in the Montreal Congress and Quebec Post-Congress can be located on this map with photos of some of the highlights.